Over the course of two tours, to England and Australia, Indian fans were treated to soul crushing and legend shattering performances from the team, as the number 1 ranking was surrendered, and then the retirements of long-time servants of Indian cricket were hastened. Indian cricket was well and truly forced into the transitional phase, which it kept talking about for years, but never really took any steps towards it. That is why, the series against New Zealand raised a lot of interest and expectations towards how India is going to plan ahead. With tough home series against England and Australia, and an overseas assignment against the current number 1 team to follow, the situation called for some bold and visionary thinking from the selectors to pick a squad keeping the future in mind. Well, if you know anything about Indian cricket and its selectors, you know what was always the most likely thing to happen. Kris Srikkanth and gang opted for the safe route and picked pretty much the same squad which had been failing overseas, but could be trusted to deliver in home conditions. Retirements forced the hand of the selectors, allowing come-back opportunities for Che Pujara and Suresh Raina, but there seemed to be no tangible measures taken in response to the drubbing in two consecutive overseas tours. 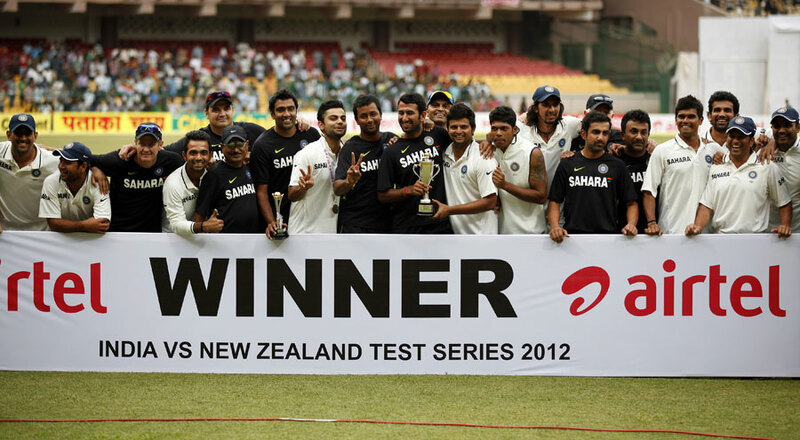 On the basis of the two Tests against the Kiwis, most of the issues remain un-resolved. I’m going to take a look at some of them and give my ideas about how to tackle it. When Gambhir and Sehwag notched a 50 run partnership in the second innings of the Bangalore test, it was their first in 12 innings. It is hard to believe that this is the same pair, who just a couple of years back, formed one of the best opening pairs in international cricket. They were instrumental in India’s rise to the top of the rankings, and it is not a surprise that India’s fall coincides with a decline in their performances. Of late, Gambhir seems to be more assured in the shorter formats than in Tests, and his dismissals mirror that fact. He keeps edging deliveries to the slip cordon while trying to run the ball down to third man, and for an opener that kind of misjudgment is career suicide. All the qualities which made him one of the best openers in Indian cricket history, seem to be in short supply and it doesn’t help that his partner is going through a similar crisis himself. Sehwag has never been a conventional opener and his success to date has defied belief. He averages over 50, has two triple tons apart from several other big centuries, and gives rapid fire starts just about every time he gets into a groove – all this despite a very unorthodox batting style bordering on the very definition of risk. Most of the time, he gets out to a poor shot and immediately is excused, saying “that’s the way he plays”. Unfortunately, nowadays we are treated to short cameo knocks from Sehwag before he gifts his wicket away, and coupled with Gambhir’s inconsistency, his inability to play the big innings he is famous for, is starting to cause headaches for India at the top. So what is the solution? Can we afford to drop either or both Gambhir and Sehwag? Should India stick with them, trusting and hoping, that the proven performers will shine against England and Australia? Personally, if there was any time to drop either opener and blood new batsmen, it was the series against a low profile team like New Zealand. With England dropping in soon, it is unreasonable to expect a replacement to perform immediately against quality opposition, when under a lot of pressure. The next best step is to give the pair another go, against England and hope they regain their appetite for huge knocks. If it doesn’t work, it is time for the team to take a leap of faith and try new players, regardless of reputation. Pujara and Kohli are good examples of youngsters who have grabbed their opportunities to replace batsmen who were considered irreplaceable till recently, and there is no reason why the likes of Rahane or Mukund can’t do the same. While two batsmen established themselves firmly in the plans for the upcoming contests, Sachin Tendulkar and Suresh Raina had a forgettable series against the Kiwis, despite looking good in patches. Tendulkar is the last of the old guard and while he may resist any overtures, his time is drawing to a close. It is a just a matter of, how he is going to leave the game – in a blaze of glorious run-scoring or a series of painful torturous innings. On the other hand, Raina is still trying unsuccessfully to convince everyone that he can handle Test cricket. These are two batsmen at different stages of their careers, but at a time when the team is going through a metamorphosis, the management has to decide whether they figure in their long term plans. In the case for Tendulkar, his experience is invaluable considering the newly re-modeled middle order is still finding its feet. While the manner of his dismissals in the series indicate a slowing of reflexes, I have seen many a Tendulkar slump before an inevitable deluge of run scoring silences the critics. He is a proud cricketer who will be hurting from the whitewashes in England and Australia, and I wouldn’t put it past him to raise his game one last time against high quality opposition. As for Raina, he’s got to go. The likes of Rahane, Badrinath and Tiwary will wonder what else they can do to get a place ahead of him, considering his inferior record in first class cricket. Despite a scratchy fifty in the first innings of the Bangalore Test, his dismissal in the second innings confirmed the fact that he does not have the temperament to be consistent in this format. If he continues to be in the XI, England and Australia are bound to feast on him. This should perhaps be the easiest decision to take for Dhoni, when the next series starts. While many agree that MS Dhoni is one of the finest skippers in international cricket when it comes to the short forms, the opinion is more divided when it comes to Tests. The arguments are mainly ‘he is too defensive’ and ‘he doesn’t deserve a place in the XI’. They have some merit, but are they really viable at this stage? Yes, Dhoni was captain during the two disastrous tours, but would any other captain have made a difference? If your batsmen experience a collective loss in form and your bowlers cannot maintain a consistent line and length, it wouldn’t matter if you were Mike Brearley. Apart from that, there are no quality alternatives at this stage. Gambhir and Sehwag are not in the best of form, and Kohli is too raw. Instead, it would be wise to groom Kohli for the captaincy, so that there is a smooth transition at the appropriate time, at least when it comes to leadership. At the moment, Dhoni is still our best bet as he commands respect and more importantly, with his performances in this series, no one can ask questions of his place in the team…for now. India has never been known for producing quality speed merchants, or for that matter any pace bowler who can compete with the best in the world. Despite that, India had two decent options this series in Zaheer Khan and Umesh Yadav. Thanks to the spinners, they didn’t really have to do much apart from taking the shine off the ball and occasionally coming on, to provide the spinners some respite after long spells. That is why it was disappointing to see their underwhelming performances, even in limited roles. Zaheer Khan is in a steady decline at the moment. He is no more the bowler he was at his pomp, and at the moment, its his guile and experience which still warrants him a place in the side. It is up to the team management to use him wisely in the coming months, as contests against quality teams are lined up. Stop using him in ODIs and T20s; preserve him for the Tests. Use him to mentor the youngsters; and given the way, Yadav bowled in the series, he has his work cut out. 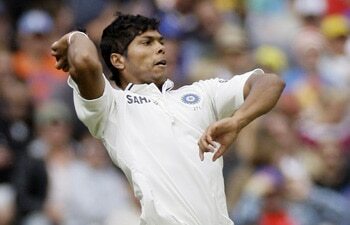 Umesh Yadav was one of the rare positives from the ill-fated tour down under, and much is expected from him. Unfortunately, his pace seems to have dropped off a little and he still has trouble with control. Given that Ishant Sharma faces the same issues and the remaining reserve of fast bowlers are even more inexperienced, there doesn’t seem to be any easy solution on hand. This is where the role of bowling coach Joe Dawes is amplified. By this time next year, India may have to depend on a completely fresh pack of fast bowlers and it is imperative that between now and then, the management identify who they think are going to stick around for a long time and prepare them for the long haul. If India are serious about retaining their number 1 ranking, they can ill afford to neglect their fast bowling resources. Give Sehwag and Gambhir one more chance during the England series. If they continue to fail, bite the bullet and blood replacements for them. Tendulkar’s presence is vital for the team till the South African tour to provide experience and guide the freshly re-modeled middle order. Raina has run out of chances, and it is time to try someone else. MS Dhoni remains our best option when it comes to captaincy. Make Kohli the permanent vice-captain and groom him for leadership in the future. Manage Zaheer wisely and build a good reserve of fast bowlers. Indian cricket is notorious for its disregard to planning ahead and taking corrective measures. Here is hoping that there is someone in the Indian cricket hierarchy, who can look past the eye-pleasing win over New Zealand and identify the short-comings. Then, hopefully we won’t need to experience anything as painful and harrowing as an 0-8 score line.